There's an epic quality to M83 that naturally lends itself to a big festival crowd, a fact Anthony Gonzalez clearly recognizes. The group's relatively short set was filled with great heights, starting with the grandiose "Reunion." Gonzalez's vocals, filtered through effects, were pitch perfect, and made even better with the assistance of singer and keyboard player Kaela Sinclair. But Gonzalez seemed happier during the handful of instrumental breaks the band played, sparring guitars with Jordan Lawlor or playing air saxophone. Guitarist Lawlor was particularly magnetic during his percussionist side-duties, attacking a cowbell from all angles before dropping a surprisingly awesome Theremin solo. Gonzalez's seeming comfort off the mic was hammered home when he left the stage entirely, ceding it to singer Mai Lan of slinky '80s R&B indebted number "Bibi the Dog" and "Go!" from this year's Junk. Predictably, it was "Midnight City" that really got the crowd going near the end of the set. 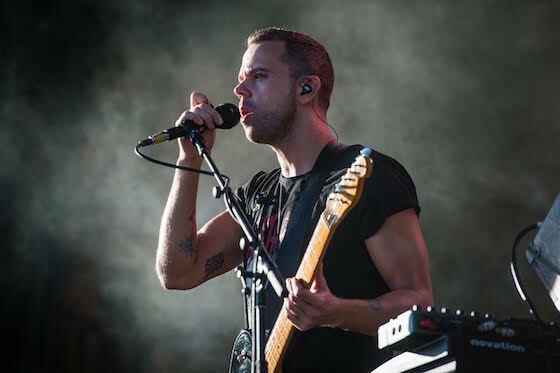 Thought slightly mercenary, M83's calculated approach was a winning strategy for both audience and players.